Racism affects health through both direct means (for example, the chronic activation of the hypothalamic-pituitary-adrenal axis and associated stress hormones, which increases susceptibility to several chronic conditions ) and indirect means (for example, the segregation of people of color into low-resource, low-opportunity neighborhoods ). In recent years, public health has embraced the promotion of health equity as a core component of the sector’s mission, goals, and strategies, recognizing that achieving the highest possible level of health for everyone requires dismantling racial inequities . 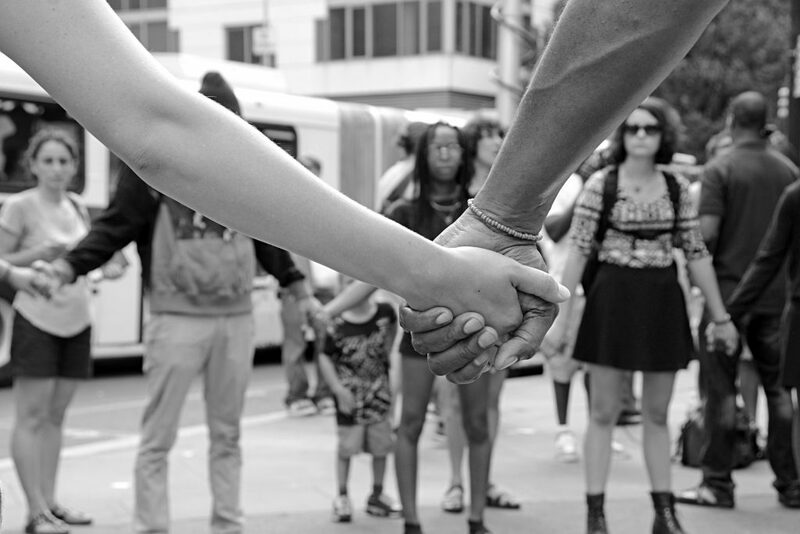 Since there is no one defined pathway to health equity, local public health professionals, community-based organizations and other allies must develop their own locally sensitive blueprints for replacing social, economic and environmental structures that reinforce inequity with ones that promote equality. As a result, health equity advocates have focused on systems and policies as disparate as criminal justice and economic development, each of which influences opportunities over the life course . But what of more subtle influences—for example, memorials many historians view as government-sanctioned artifacts of white supremacy, intended to constantly remind people of color where they rank in the social order ? Is there a public health case to be made for changing facets of the built environment that shape the narrative of place, in the same way that public health has advocated for built environments that promote physical activity and access to healthy food? 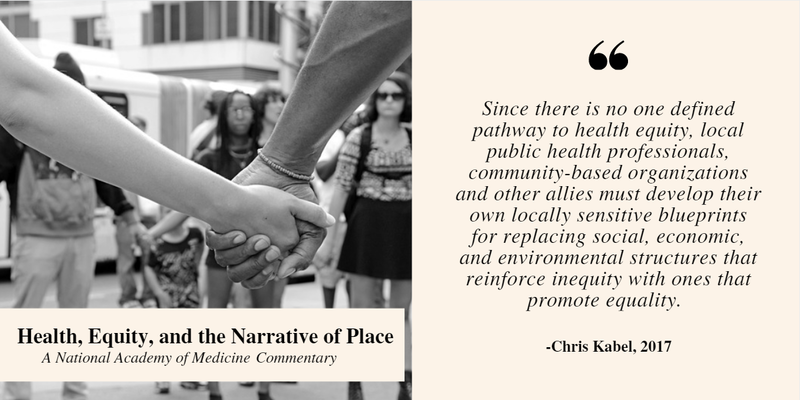 The narrative of place played a prominent role during the most recent meeting of the Roundtable on the Promotion of Health Equity at the National Academies of Science, Engineering, and Medicine, held on June 13 in Prattville, Alabama (a suburb of Montgomery). One session featured Felicia Lucky of the Black Belt Community Foundation (based in Selma, Alabama), Ashley Browning from the Appalachian Community Fund (based in Knoxville, Tennessee), and Dolores Roybal from the Con Alma Health Foundation (based in Santa Fe, New Mexico). Each spoke of their efforts to reframe the dominant narratives about their regions from those that emphasized deficits and needs to those that honor assets, tradition and culture. This year has witnessed high-profile attempts to remove Confederate memorials and other symbols that many see as markers of white supremacy, as well as the sometimes violent backlash from those who wish to preserve them. The most prominent example occurred in Charlottesville, Virginia, where the proposal to remove a statue honoring Robert E. Lee—who led an armed secession from the United States, in large part to preserve slavery—was met with an organized and violent effort that resulted in one death and multiple injuries . Earlier this year, New Orleans removed four Confederate memorials after Mayor Mitch Landrieu declared the Confederacy to be on “the wrong side of humanity” . The company that the city originally contracted to remove the memorials withdrew after the owner received death threats and had his car firebombed. While Confederate memorials and monuments represent the most prominent facets of the built environment that celebrate white supremacy, they are by no means alone. Another statue on the grounds of the Alabama capitol commemorates Dr. J. Marion Sims, often described as the “father of modern gynecology.” Dr. Sims earned this honor by performing experimental surgeries on enslaved women in the 1840s without informed consent and without anesthetic (ether had been introduced as a surgical anesthesia several years earlier). The fact that Dr. Sims thought so little of black lives is not entirely surprising—but the fact that the Alabama state government thought to venerate him and place his statue in a prominent location overlooking Montgomery (57 percent of whose residents are African American) sends a powerful signal that white prestige is more important than black lives. Is there a public health case to be made for removing these physical markers of white supremacy and replacing them with environmental features that represent a more complete expression of the American experience—one that celebrates the culture and contributions of communities that have historically been marginalized or disenfranchised? Several promising efforts are already underway. For example, the Equal Justice Initiative (EJI) is working to counterbalance the veneration of the Confederacy with the erection of public monuments recognizing the racial terror lynchings that claimed the lives of more than four thousand African American men, women, and children throughout the South from the end of Reconstruction through World War II . Earlier this year, the staff of EJI completed an intensive engagement process that resulted in the erection of a memorial to Anthony Crawford, who was publicly lynched in the town square of Abbeville, South Carolina for refusing to sell his cottonseed at a price lower than that offered to white farmers . EJI’s engagement process included descendants of Anthony Crawford and multiple community constituencies. Crawford’s family was forced to abandon his 427-acre farm (which was subsequently appropriated by white landowners) and flee north. This marker serves as a counterweight to a Confederate memorial that also stands in Abbeville, and tells a more complete narrative of the town. EJI has received requests from other cities to erect similar memorials. Another way in which historically disadvantaged communities have reclaimed the narrative of place is through creative placemaking—the practice of integrating art, culture and community-engaged design in comprehensive community development . One example of how communities have used creative placemaking comes from Saint Paul, Minnesota, where the Asian Economic Development Association (AEDA) has led a collaborative effort in the Frogtown and Rondo neighborhoods to celebrate the diverse cultures that call these neighborhoods home. Through food, performance, festivals and physical transformation, AEDA and its partners have created a sense of pride and social cohesion, while revitalizing the neighborhoods on their own terms . Several other promising efforts can be found in Communities in Action: Pathways to Health Equity, published this year by the National Academies Press . While racism has been shown to affect health, there is no scientific parts-per-million equivalent for exposure to racism as there is for other toxins—and the movement to dismantle structural racism should not be held to such an artificial standard to justify its validity. Just as the public health field does not need to demonstrate that particular gun control legislation would have prevented a specific mass shooting to advocate for stricter gun laws, or that the lethality of hurricanes have increased by a specific percentage to advocate for climate action, we should not feel obliged to demonstrate a direct causal pathway between venerations of white supremacy and its continuing effects on populations that have been traumatized over generations by racial violence, segregation and disadvantage. Similar to the public health assertion that there is no safe level of exposure to lead or to cigarette smoke, one could argue that there is no safe level of exposure to structural racism. While facets of structural racism—such as disparate access to capital or disproportionate sentencing practices—may be resolved through years or decades of unwinding multiple policies and institutional norms, removing physical artifacts erected by local governments and widely interpreted as markers of white supremacy can be fairly straightforward, as illustrated recently by the City of Baltimore . Public health has worked to reduce and eliminate exposures known to contribute to health disparities in other facets of the physical environment, and the removal of monuments to white supremacy can be viewed as an extension of this robust tradition. Gee, G. C., K. M. Walsemann, and E. Brondolo. 2012. A life course perspective on how racism may be related to health inequities. American Journal of Public Health 102(5):967-974. Acs, G., R. Pendall, M. Treskon, and A. Khare. 2010. The cost of segregation: National trends and the case of Chicago, 1990-2010. Washington, DC: Urban Institute. Braveman, P. A., S. Kumanyika, J. Fielding, T. LaVeist, L. N. Borrell, R. Manderscheid, and A. Troutman. 2011. Health disparities and health equity: The issue is justice. American Journal of Public Health 101(Supplement 1):S149-S155. The root causes of health inequity. 2017. In Communities in action: Pathways to health equity, edited by J. Weinstein, A. Geller, Y. Negussie, and A. Baciu. Washington, DC: The National Academies Press. Pp. 99-162. Cox, K. L. 2017. The whole point of Confederate monuments is to celebrate white supremacy. The Washington Post, August 16. https://www.washingtonpost.com/news/posteverything/wp/2017/08/16/the-whole-point-of-confederate-monuments-is-to-celebrate-white-supremacy/?utm_term=.b5de29344288 (accessed September 24, 2017). Stolberg S. G., and B. M. Rosenthal. 2017. Man charged after white nationalist rally in Charlottesville ends in deadly violence. The New York Times, August 12. https://www.nytimes.com/2017/08/12/us/charlottesville-protest-white-nationalist.html?_r=0 (accessed October 23, 2017). Mitch Landrieu’s speech on the removal of Confederate monuments in New Orleans. 2017. The New York Times, May 23. https://www.nytimes.com/2017/05/23/opinion/mitch-landrieus-speech-transcript.html (accessed October 23, 2017). Lynching in America: Confronting the legacy of racial terror 2nd ed. 2015. Montgomery, AL: Equal Justice Initiative. Equal Justice Initiative. 2017. EJI releases a new video about a community’s response to lynching. https://eji.org/videos/abbeville (accessed September 24, 2017). How to do creative placemaking. 2016. Washington, DC: National Endowment for the Arts. Greider, K. 2017. A market that kindles culture and commerce. New York: Local Initiatives Support Corporation. http://www.lisc.org/our-stories/story/Market-Kindles-Culture-Commerce (accessed September 24, 2017). Examples of communities tackling health inequity. 2017. In Communities in action: Pathways to health equity, edited by J. Weinstein, A. Geller, Y. Neguisse, and A. Baciu. Washington, DC: The National Academies Press. Pp. 211-322. Nirappil, F. 2017. Baltimore hauls away four Confederate monuments after overnight removal. The Washington Post, August 16. https://www.washingtonpost.com/local/md-politics/baltimore-begins-taking-down-confederate-statues/2017/08/16/f32aa26e-8265-11e7-b359-15a3617c767b_story.html?utm_term=.312e451cf0fb (accessed October 23, 2017). Chris Kabel, MPH, is the deputy director of the Health Program and the director of cross-team initiatives at The Kresge Foundation, and a member of the Roundtable on the Promotion of Health Equity at the National Academies of Science, Engineering, and Medicine. Questions or comments should be directed to Chris Kabel at cmkabel@kresge.org.